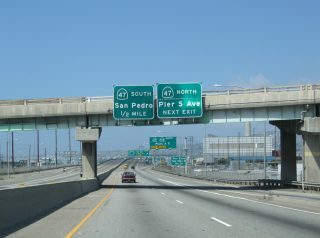 Interstate 710 leading south from I-405 adjacent to the Los Angeles River in Long Beach. 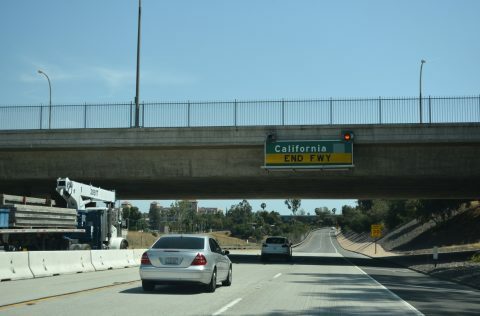 Photo taken 06/15/13. 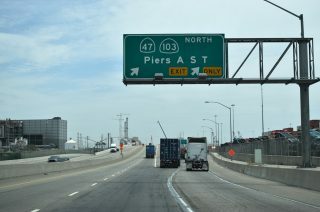 Interstate 710 connects Terminal Island and the city of Long Beach with East Los Angeles along the Long Beach Freeway. 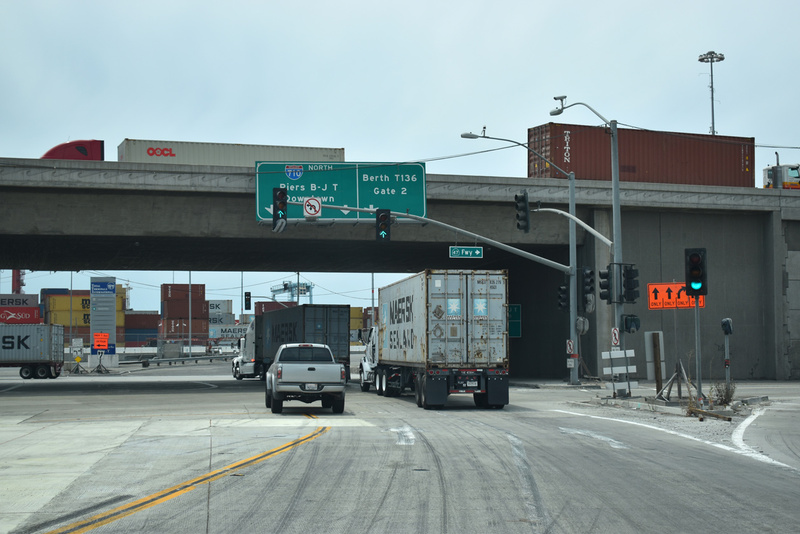 Carrying a substantial freight traffic, I-710 initially heads east from the Port of Long Beach across the Gerald Desmond Bridge toward Downtown Long Beach. 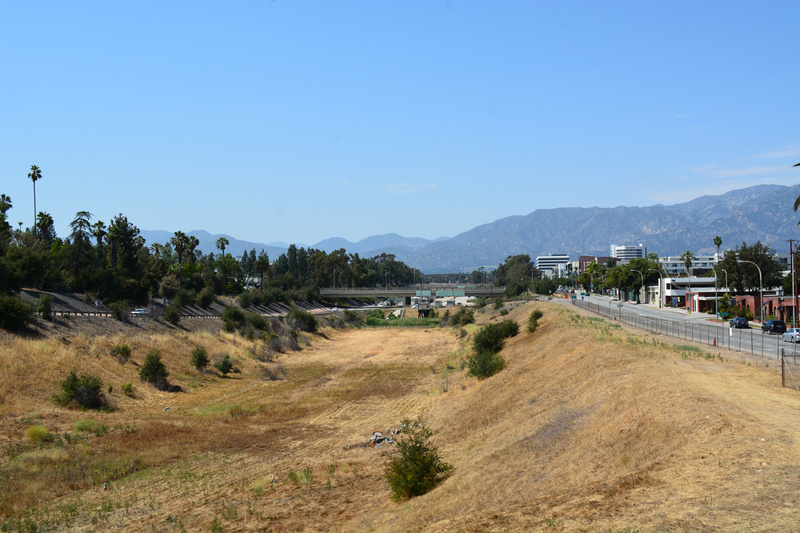 Paralleling the Los Angeles River, the freeway travels north to Compton, Paramount, Lynnwood, South Gate and Downey. Diverging with the culverted river, the Long Beach Freeway extends north through Commerce to I-5 (Golden State Freeway), and unincorporated East Los Angeles ahead of SR 60 (Pomona Freeway) and I-10 (San Bernardino Freeway). 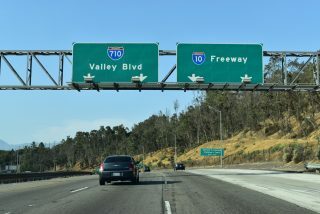 Interstate 710 spurs north to Valley Boulevard between the Los Angeles and Alhambra city line. 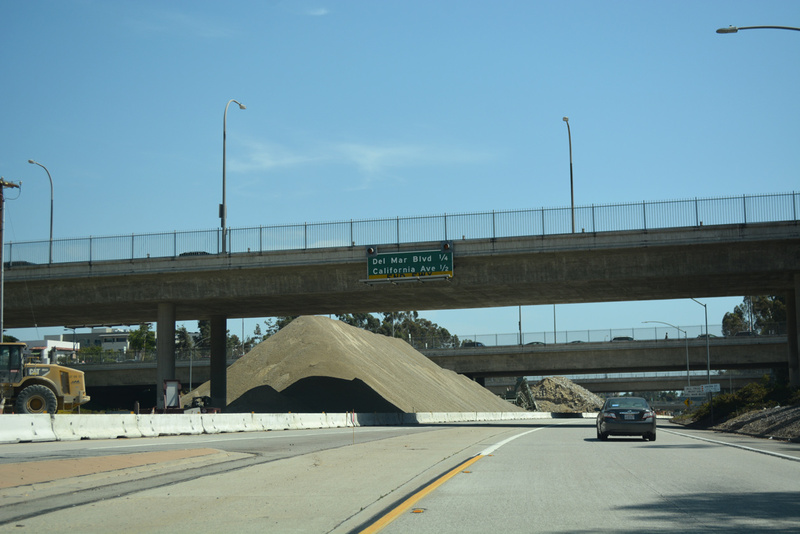 The continuation of I-710 north remains unbuilt. 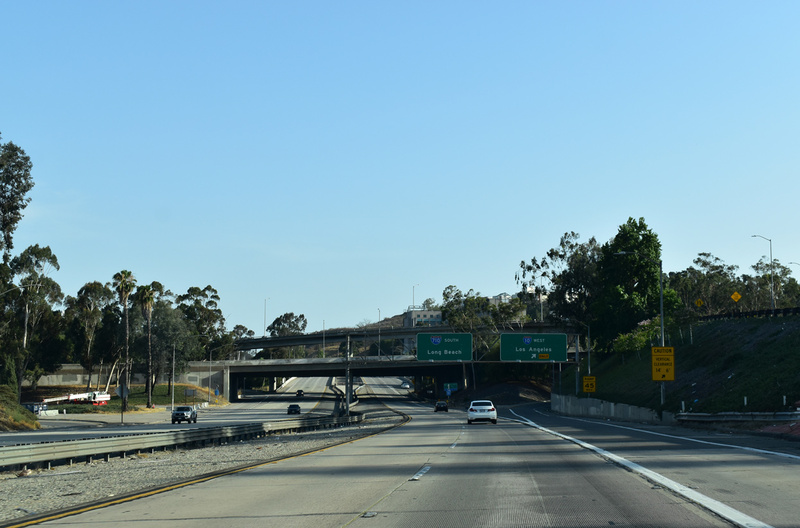 A short section of freeway spurs south from the exchange joining I-210 (Foothill Freeway) with SR 134 (Ventura Freeway) in the city of Pasadena. Designed as SR 710, but not signed in the field, the 1.75 mile long route represents the planned northernmost extent of the Long Beach Freeway. Postmiles for SR 710 (30.953 to 32.709) originate at Columbia Street and conclude at I-210. 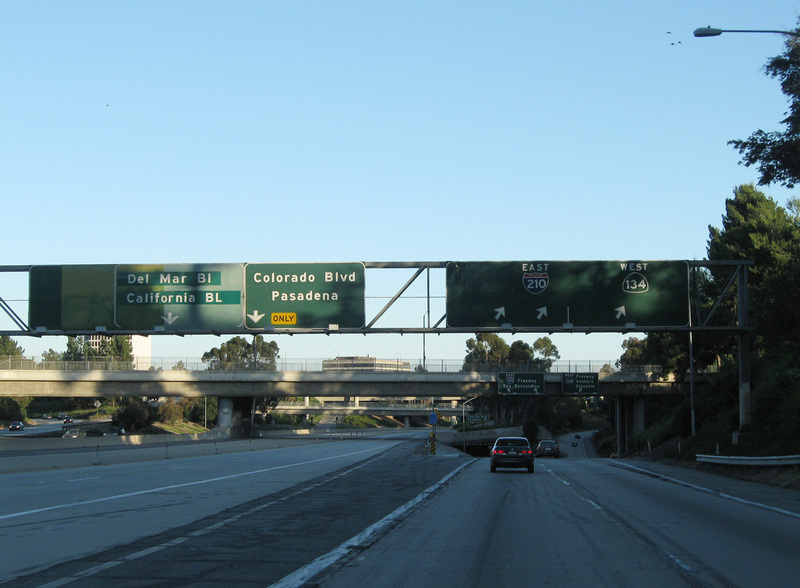 Section 622. 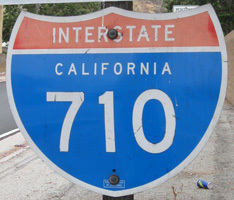 Route 710 is from Route 1 to Route 210 in Pasadena. Section 622.1. 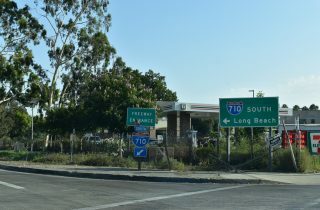 (a) Route 710 shall also include that portion of the freeway between Route 1 and the northern end of Harbor Scenic Drive, that portion of Harbor Scenic Drive to Ocean Boulevard, that portion of Ocean Boulevard west of its intersection with Harbor Scenic Drive to its junction with Seaside Boulevard, and that portion of Seaside Boulevard from the junction with Ocean Boulevard to Route 47. Based on this legislation, the first connection of Route 710 leads southeast from Exit 1C into Downtown Long Beach via Shoreline Boulevard. The second spur extends south from Exit 1A along the west bank of the Los Angeles River to the Queen Mary, a major attraction in Long Beach. 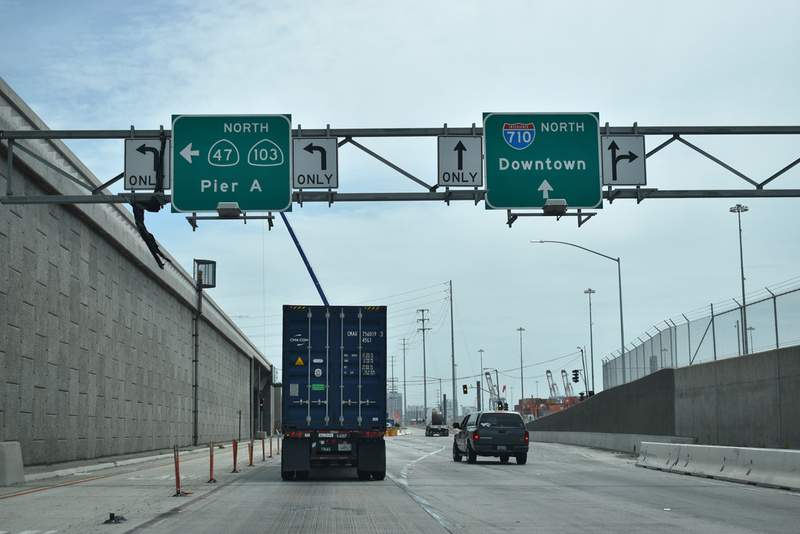 The third spur is the I-710 mainline across the Gerald Desmond Bridge onto Terminal Island. 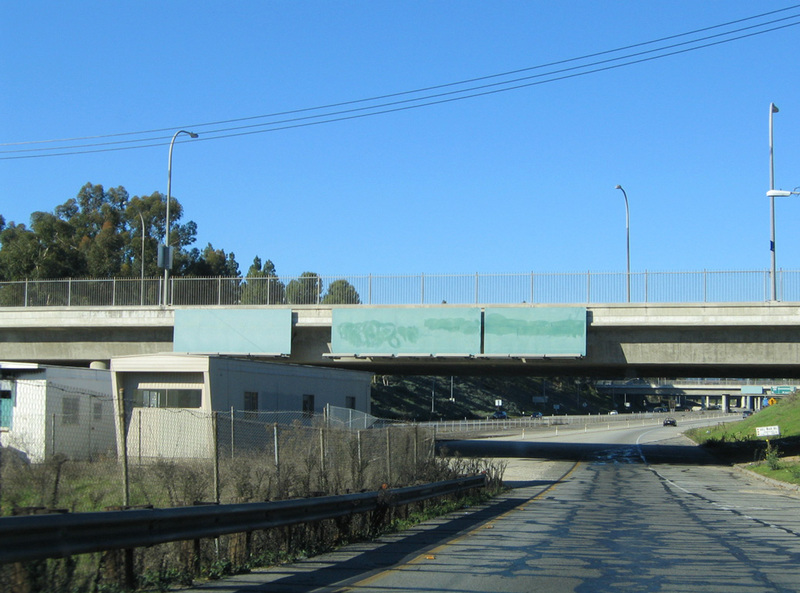 The I-710 gap between Valley Boulevard and I-210 in 1973. 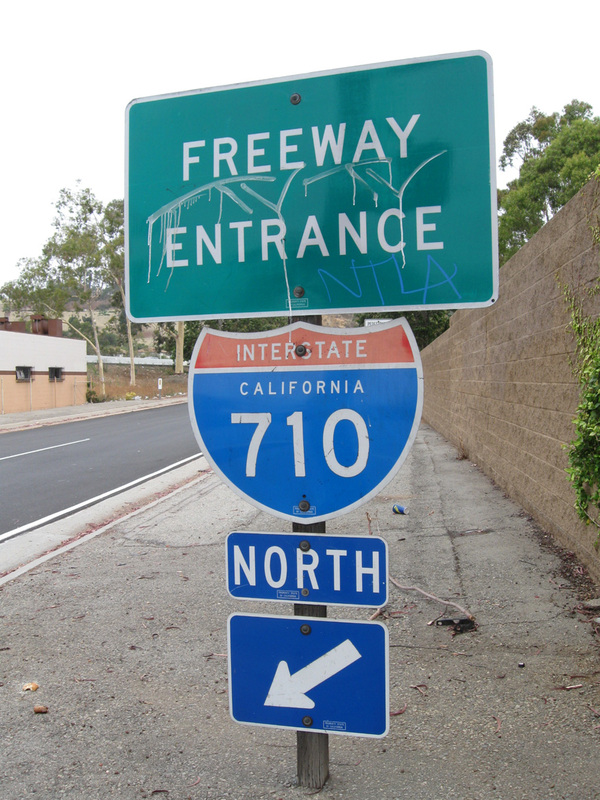 A remaining reference for California 7 at the I-710 northbound entrance ramp from Floral Boulevard in Los Angeles. 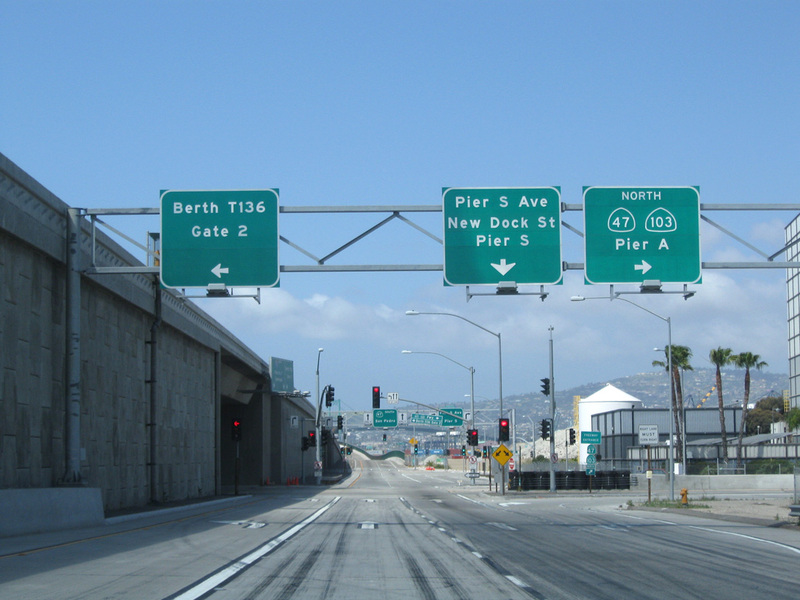 Caltrans Postmiles for Route 710 start at the ramps joining the Seaside Freeway (SR 47), Terminal Island Freeway (SR 47/103) and the Gerald Desmond Bridge (I-710). 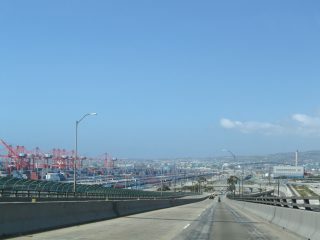 The legs south to Harbor Island and east to Downtown Long Beach are not included in the Postmile system. Route 710 north to Valley Boulevard is 24.021 miles per Caltrans Postmiles. 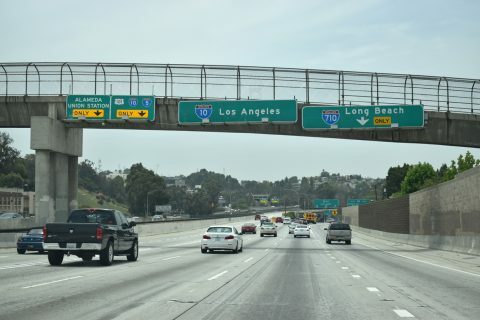 The FHWA Route Long and Finder List however attributes only 19.66 miles for Interstate 710, between SR 1 in Long Beach and I-10 at East Los Angeles. 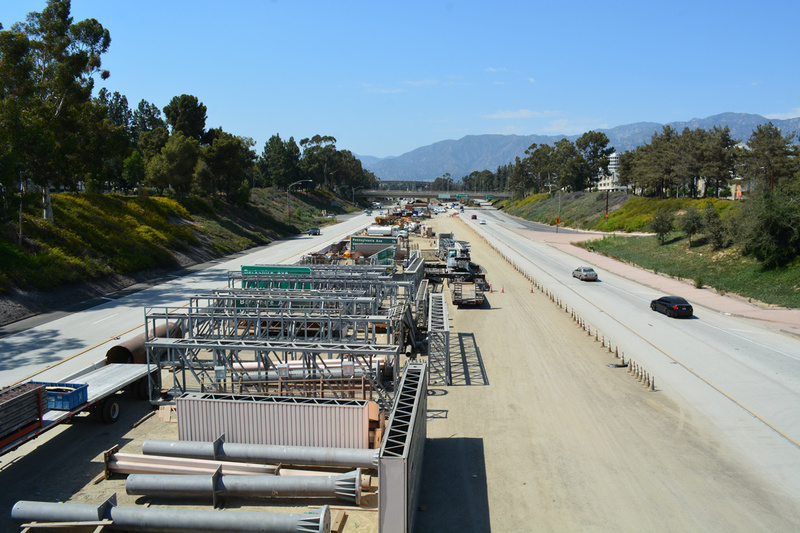 Gerald Desmond Bridge Replacement Project – Photo taken 07/09/18. 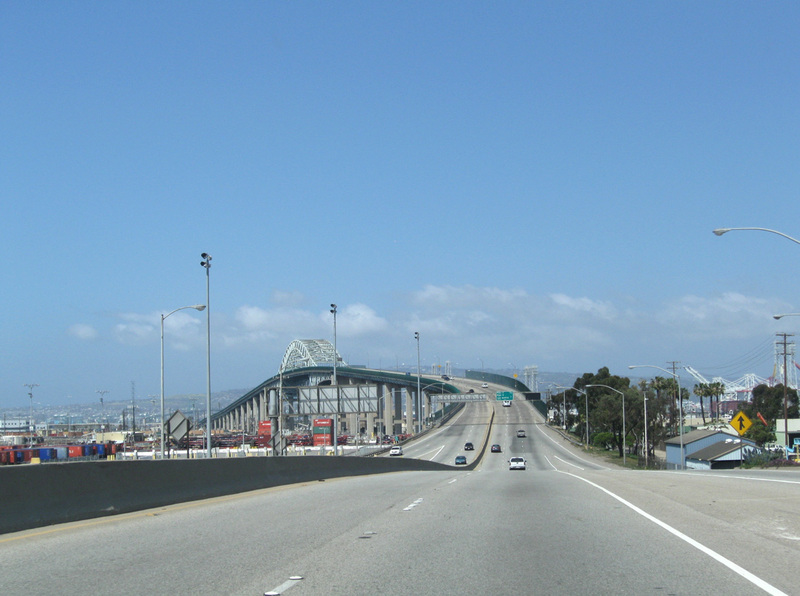 The original through arch bridge spanning the Back Channel on Terminal Island was constructed in the 1960s. 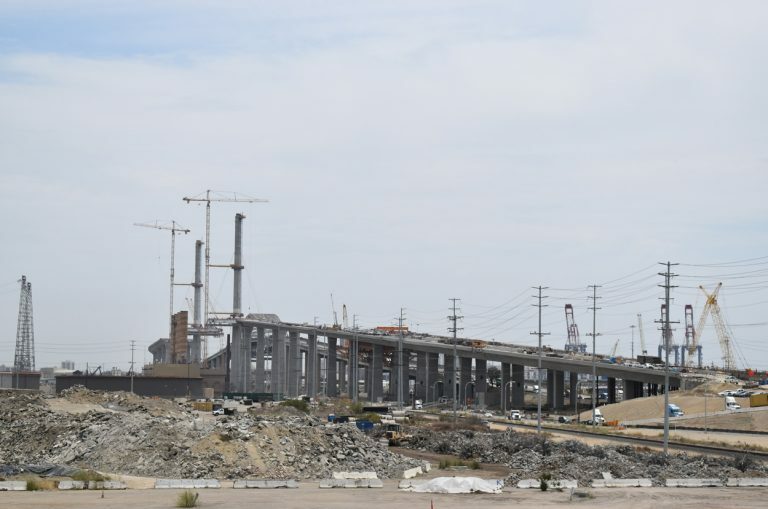 The Gerald Desmond Bridge Replacement project, scheduled for completion in 2020, constructs a cabled stayed bridge spanning the waterway with a 205 foot vertical clearance. 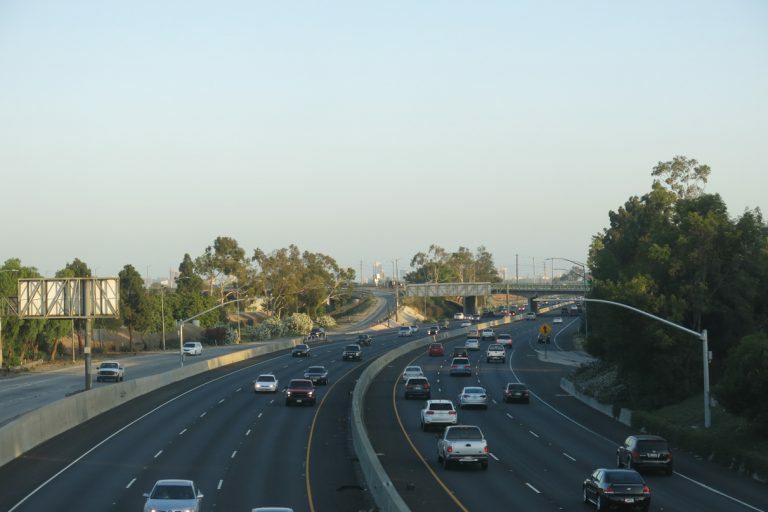 Supported by two 515 foot high towers, the bridge will accommodate six lanes of traffic, the Mark Bixby Memorial Bicycle and Pedestrian Path, and three scenic overlooks. 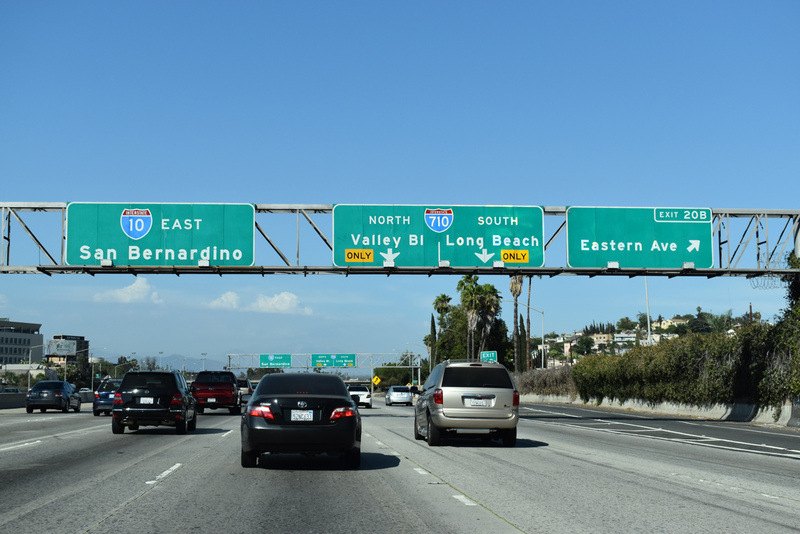 I-710 from the Port of Long Beach north to California 60 is part of High Priority Corridor 46: Interstate 710. The Long Beach Freeway was added to the Interstate Highway System in 1984 to replace the SR 7 designation. 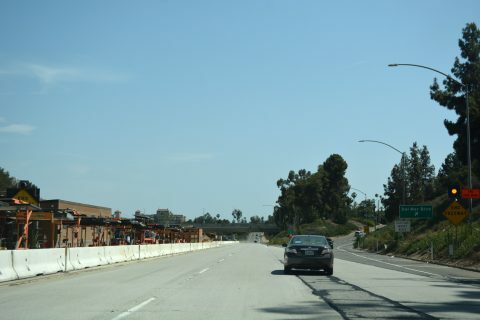 SR 7 previously replaced SR 15 along the same freeway. 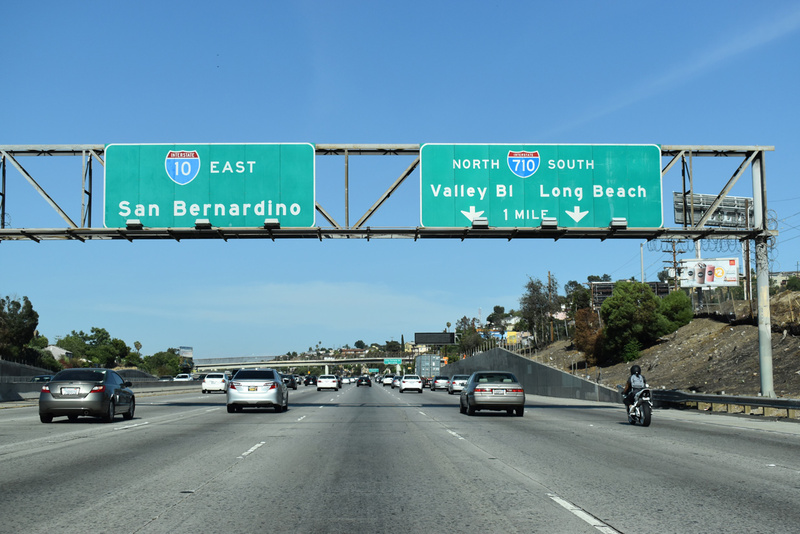 I-710 was added after Interstate 110 replaced SR 11 along the parallel Harbor Freeway to the west in 1981. 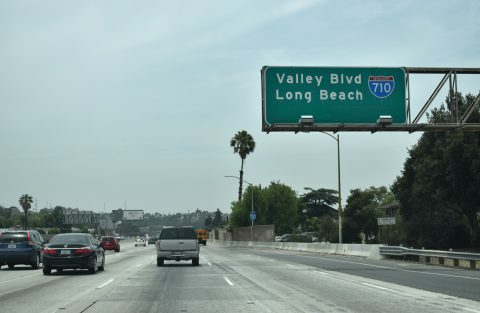 The freeway was planned to link Long Beach with Interstate 210 in Pasadena, but high costs and vehement community opposition prevented the ultimate build out. 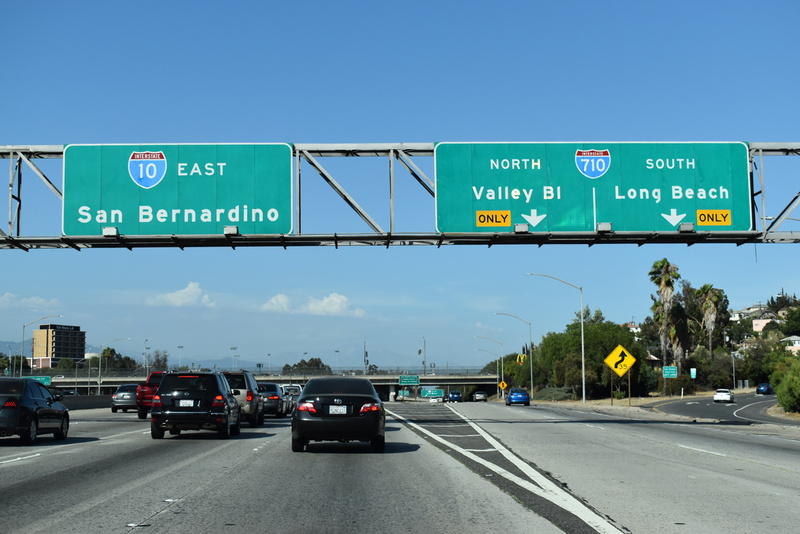 Despite continued opposition, lawsuits and the requirement of additional environmental studies, the planned alignment of I-710 north to Pasadena perserveered for several decades. 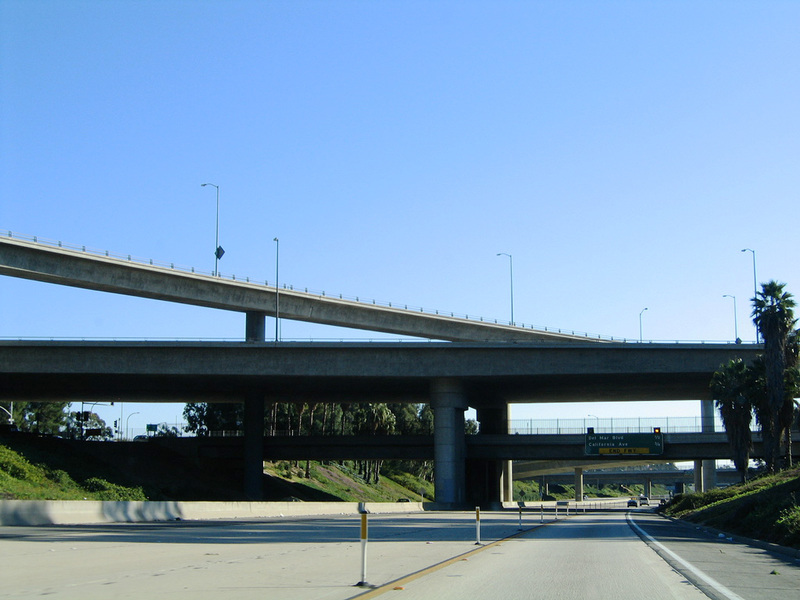 The project received a record of decision from the Federal Highway Administration (FHWA) in April 1998. 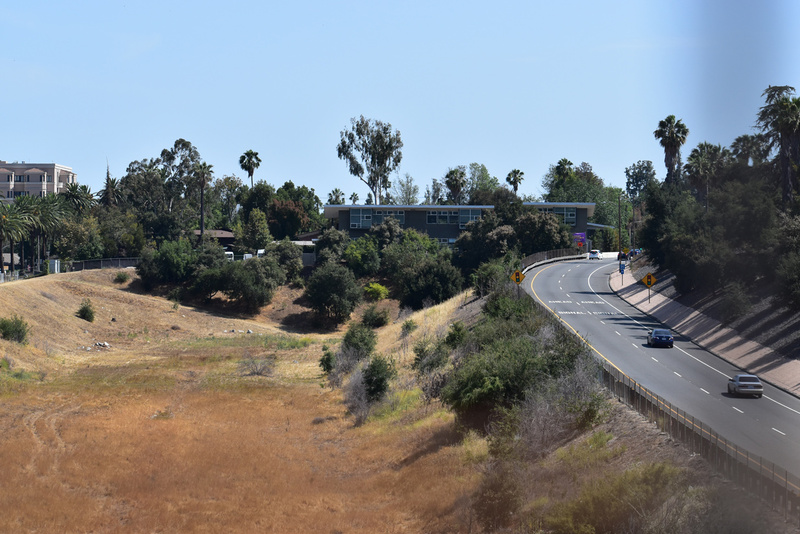 It was met with opposition from the city of South Pasadena, environmental groups such as the Friends of the Earth, local community leaders, and residents potentially impacted by the project. 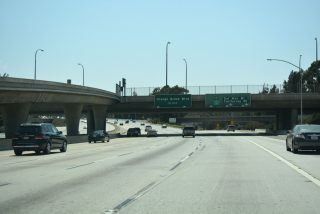 The partially built freeway spur for the Long Beach Freeway (State Route 710) in Pasadena. The FHWA required that Caltrans produce another environmental impact statement in December 2003. 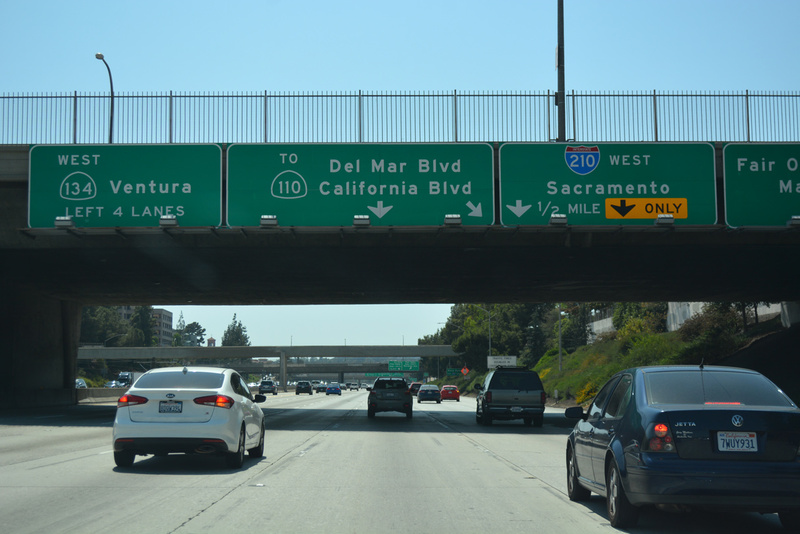 The succeeding study would evaluate additional impacts of the freeway that were not previously been addressed. 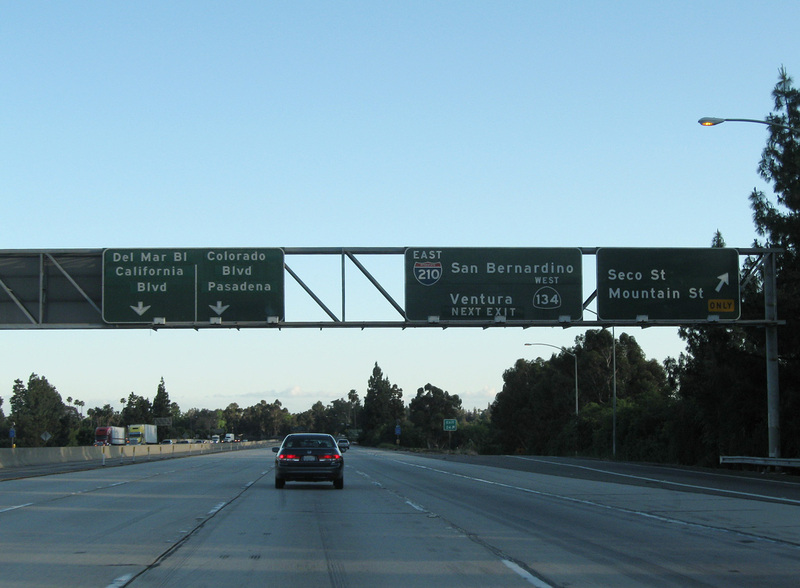 Subsequently, the environmental clearance for the route was rescinded by Caltrans in April 2004. 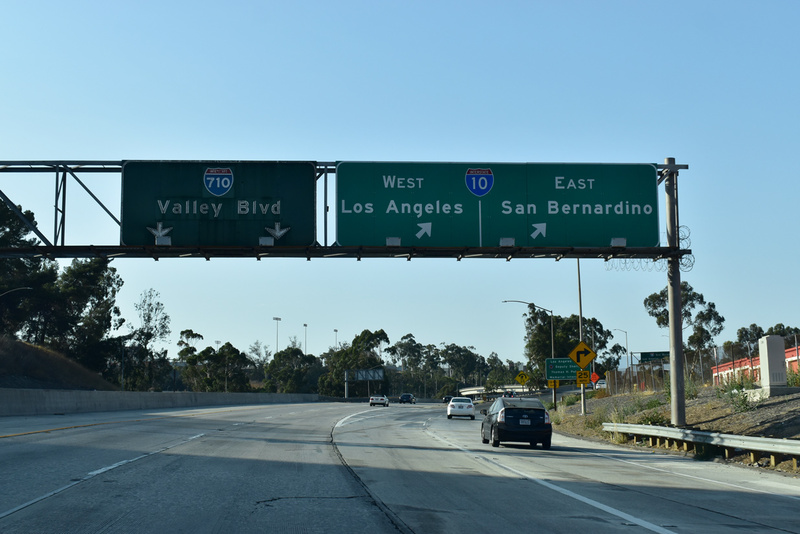 The original plan called Interstate 710 to be built as a below grade freeway, similar to the SR 210 extension in eastern Los Angeles and western San Bernardino Counties. Options also considered adding cut and cover tunnels, or constructing a longer tolled tunnel. 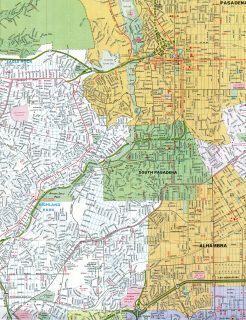 Scenarios still involved the removal of several homes, some of which were already owned by Caltrans and are rented out. 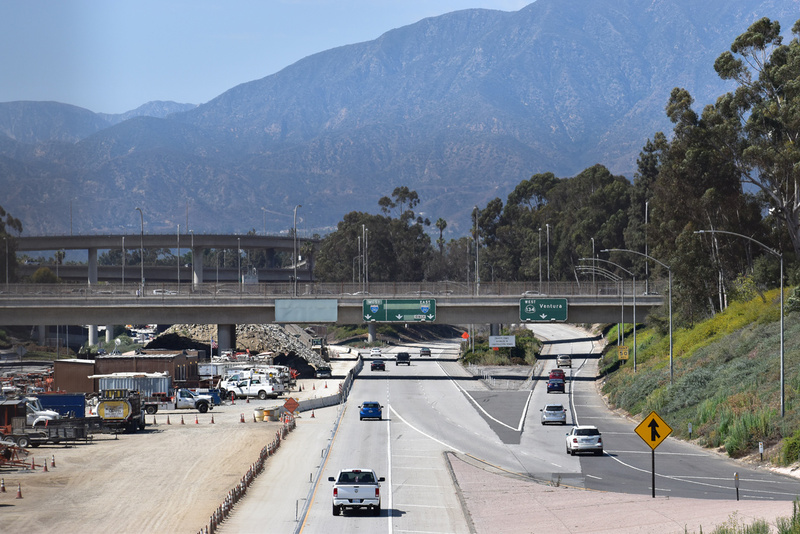 Despite the high costs of constructing a tunnel system along the proposed route, some believed that it would still not mitigate the impact to the communities. 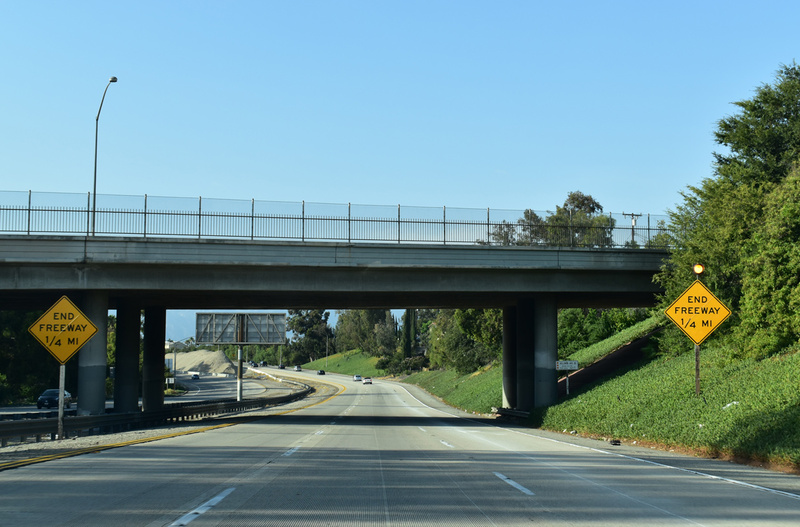 Urban Freeway Renewal. 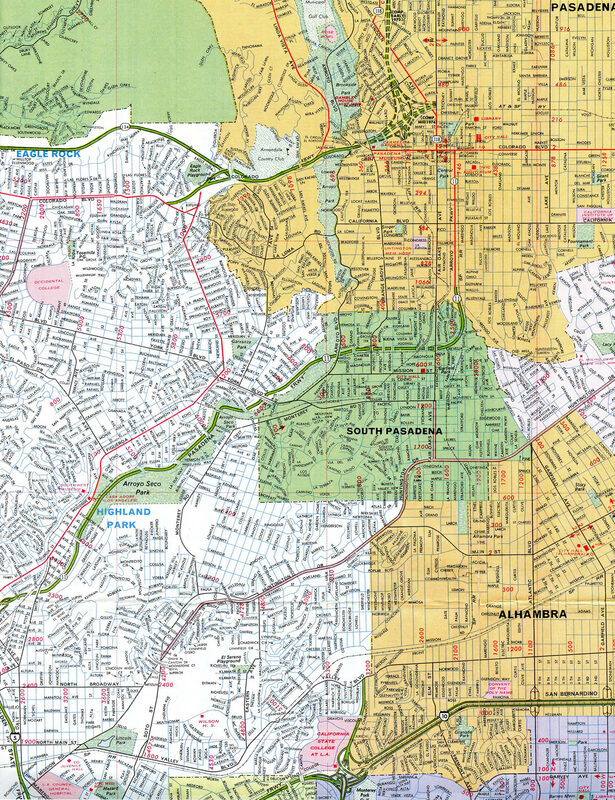 Public Roads, Nov/Dec 1998. 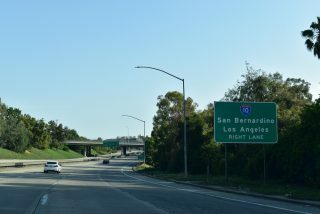 Interstate 710 (Long Beach Freeway) navigates through an S-curve leading into the cloverstack interchange with I-10 (San Bernandino Freeway). Photo taken 07/08/18. 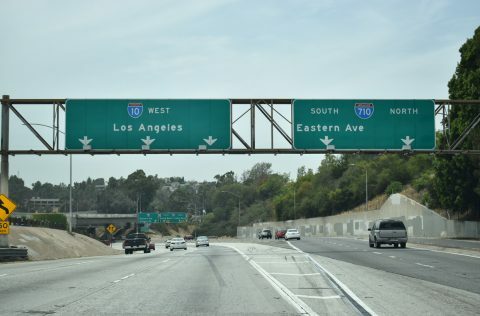 Two lanes separate from Interstate 710 northbound for I-10 west into Los Angeles and I-10 east across Monterey Park, Rosemead and El Monte. Photos taken 07/08/18 and 06/20/15. Interstate 710 straddles the Alhambra and Los Angeles city line a half mile north to Valley Boulevard. 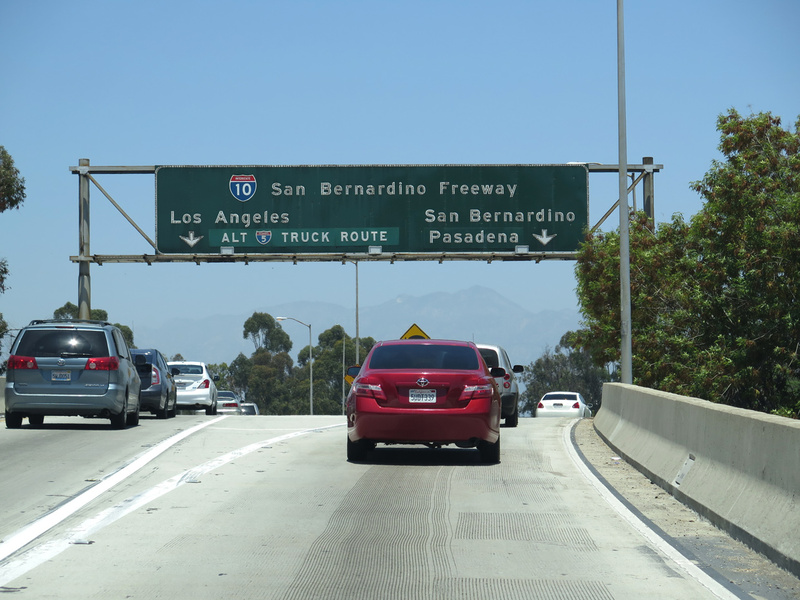 Photos taken 07/08/18. Roadways stubs were built for the cancelled extension of the Long Beach Freeway north to South Pasadena. Photo taken 07/08/18. 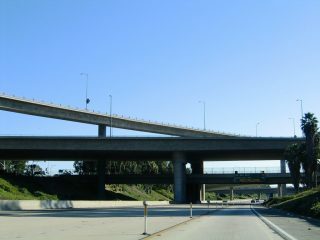 A partially built diamond interchange joins the Long Beach Freeway with Valley Boulevard west to El Sereno in Los Angeles and east into Alhambra. Photo taken 07/08/18. 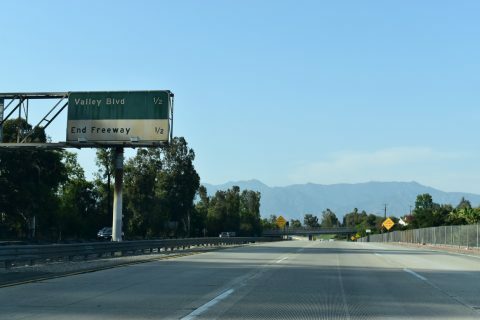 Valley Boulevard at the freeway entrance for Interstate 710 south to Monterey Park and East Los Angeles. Photo taken 07/08/18. The Long Beach Freeway stems a half mile south from the roadway stubs at Valley Boulevard to the ramps for Interstate 10 (San Bernardino Freeway). 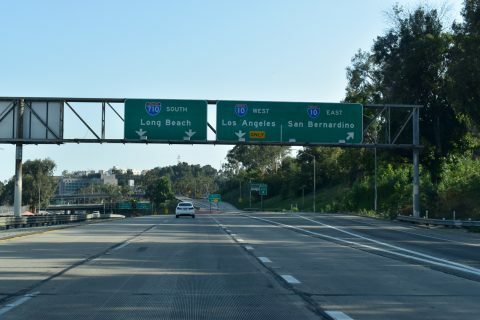 Photos taken 07/08/18. 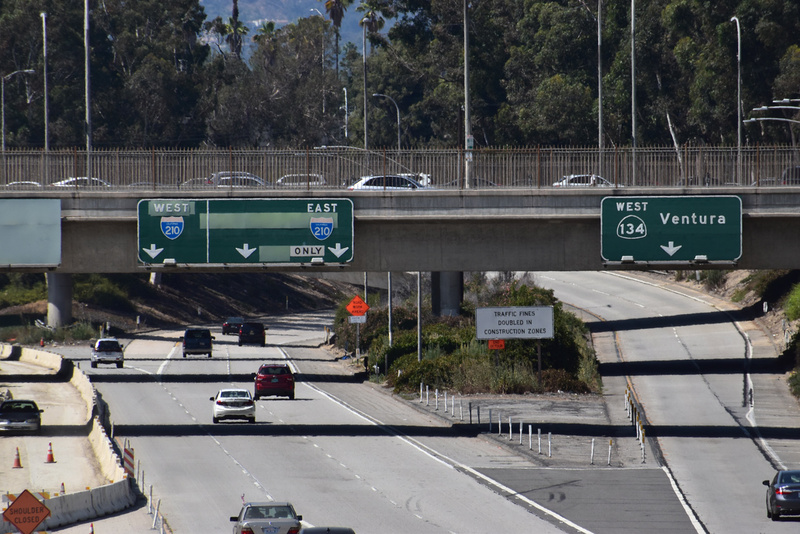 Traveling along side the campus of Cal State LA, Interstate 710 reaches the westbound ramp for I-10 to Downtown Los Angeles and the El Monte Busway. Photo taken 07/08/18. 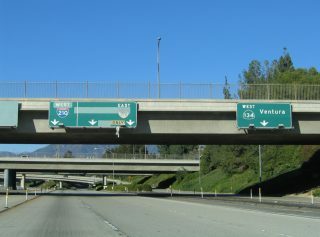 Advancing south through the cloverstack interchange (Exit 22) with Interstate 10, I-710 enters the city of Monterey Park. Photo taken 07/08/18. 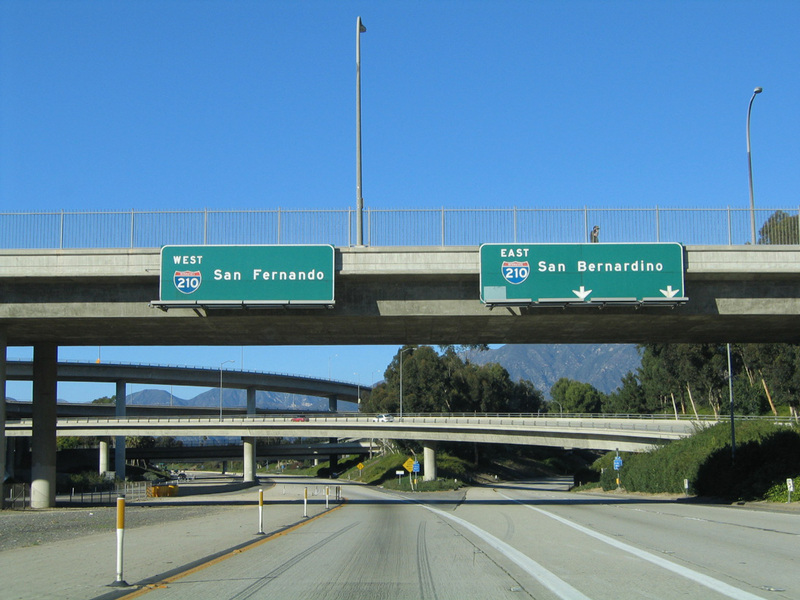 A collector distributor roadway (Exit 21) joins Interstate 10 (San Bernardino Freeway) eastbound with both directions of I-710 and parallel Ramona Boulevard. 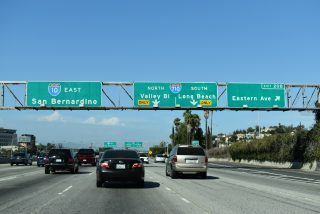 Photos taken 07/12/18. 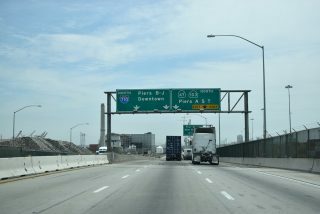 Interstate 10 angles southwest from Ross Avenue in Alhamba to Fremont Avenue and Exit 21 with I-710 (Long Beach Freeway). Photos taken 07/09/18. Interstate 10 partitions with the El Monte Busway just ahead of the ramps for I-710 north to Valley Boulevard and south to Long Beach. Photos taken 07/09/08. 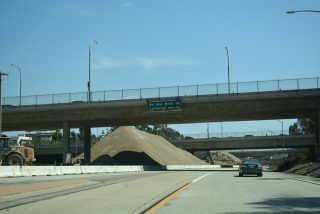 A pair of ramps join South Pasadena Avenue with the Long Beach Freeway spur northbound to I-210 and SR 134 respectively. Photo taken 07/08/18. 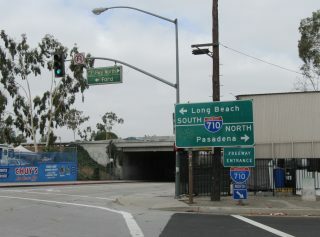 The SR 710 entrance ramp from South Pasadena Avenue passes below a set of blank sign boards at the Del Mar Boulevard over crossing. Photo taken 11/14/04. 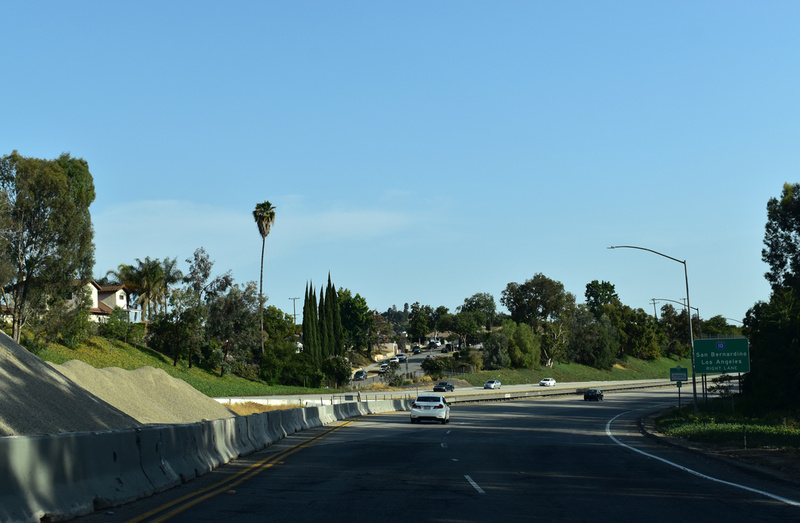 The first on-ramp to SR 710 from Pasadena Avenue links with the freeway mainline to Interstate 210. The succeeding ramp from Del Mar Boulevard connects with the flyover for SR 134 (Ventura Freeway) westbound. 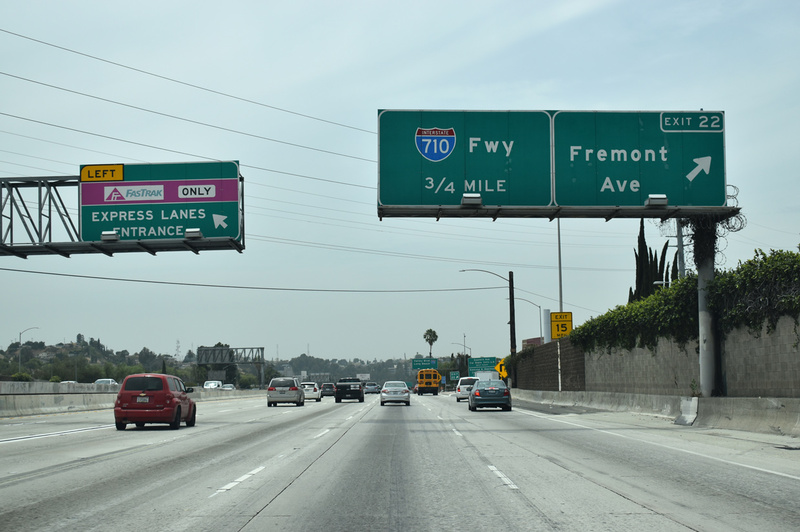 Photo taken 11/14/04 and 07/08/18. The northbound roadway along SR 710 overtakes I-210 along the Foothill Freeway west toward San Fernando. 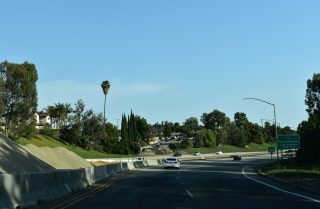 A two-lane ramp leads east toward Arcadia, Monrovia and Duarte. 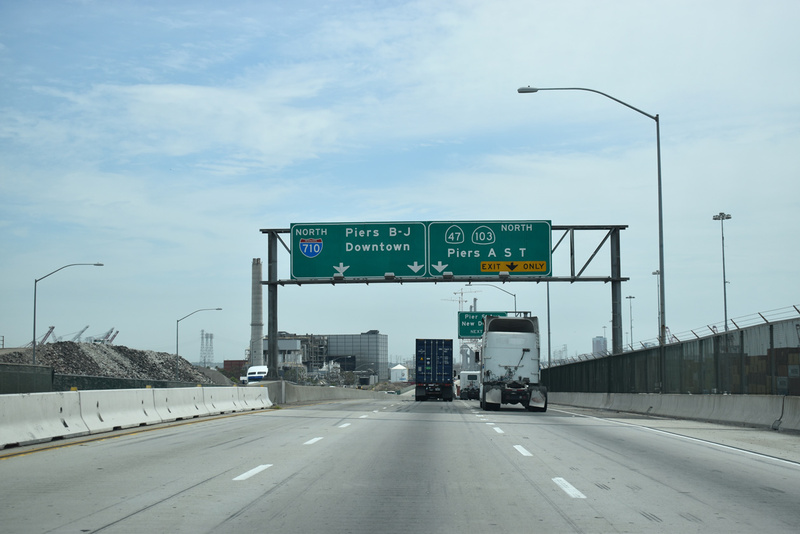 Photo taken 11/14/04. Interstate 210 (Foothill Freeway) turns south ahead of Exit 24 with Mountain Street and the exchange with SR 134 (Ventura Freeway) west and SR 710 (Long Beach Freeway) south. Photo taken 05/15/11. 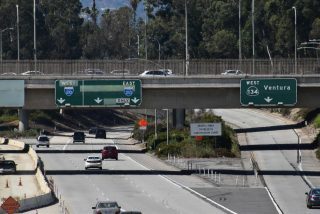 I-210 makes a TOTSO (turn off to stay on) movement along a two lane ramp at the systems exchange with the Long Beach Freeway spur into Pasadena. 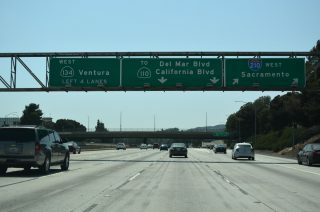 Photo taken 05/15/11. 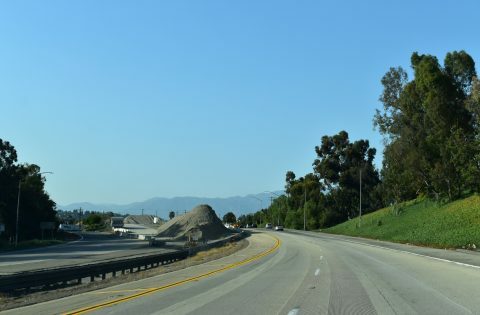 The Foothill Freeway mainline defaults onto unsigned SR 710 south. 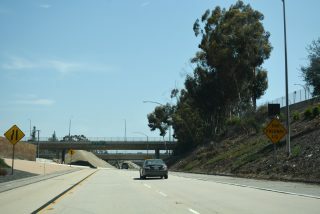 I-210 navigates through a tunnel east from SR 134. Photo taken 05/15/11. 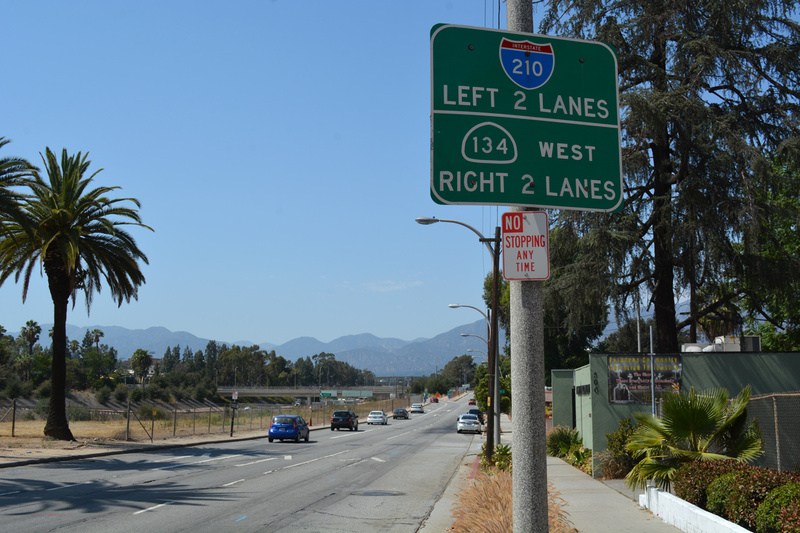 Guide signs for the SR 710 freeway spur reference the connection with SR 110 (Arroyo Seco Parkway) via St. John Avenue and Pasadena Avenue south. Photos taken 07/08/18. 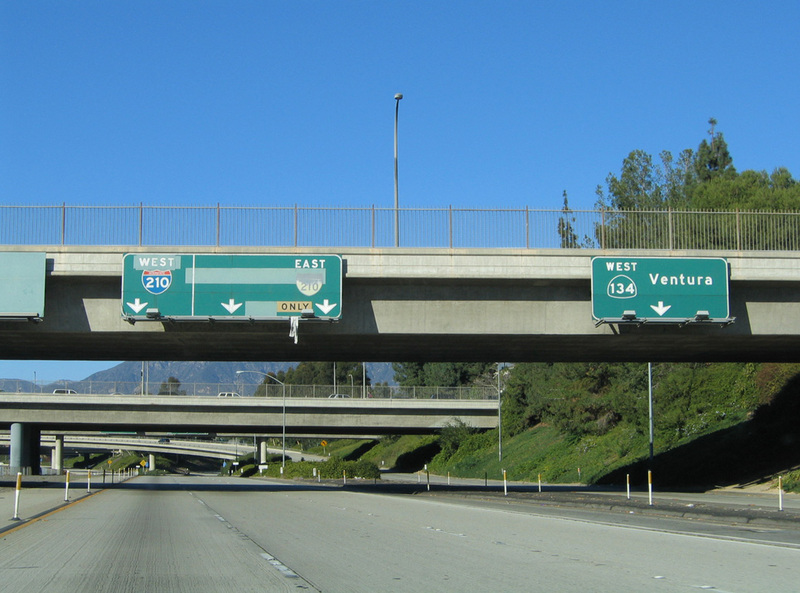 Interstate 210 branches northward at the systems interchange with the Long Beach Freeway spur as the Ventura Freeway (SR 134) commences westward to Glendale. Photos taken 07/08/18. 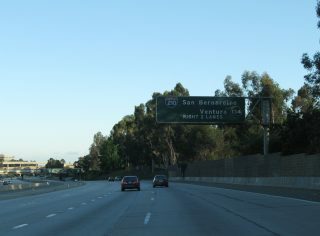 Exit 13B departs SR 134 (Ventura Freeway) westbound for the SR 710 freeway spur. Photo taken 07/08/18. 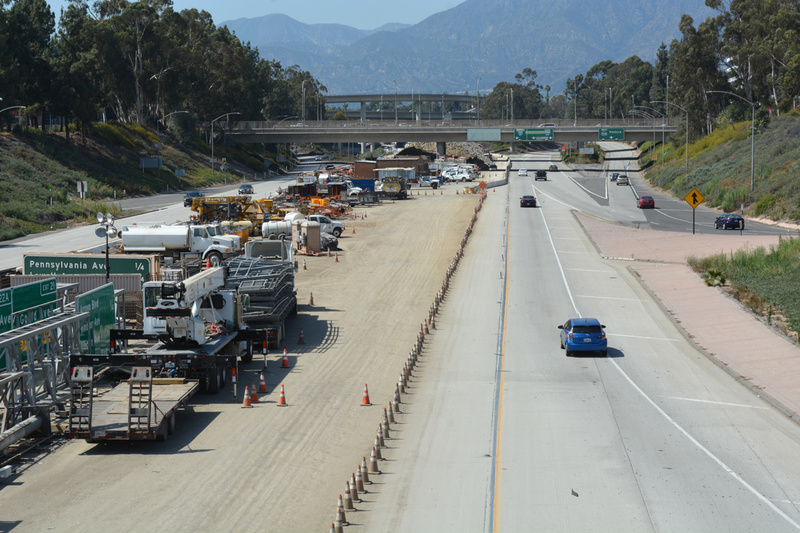 A single lane continues south from the Colorado Boulevard (old U.S. 66) off-ramp on the roadway leading south from I-210 east to SR 710 (Long Beach Freeway). 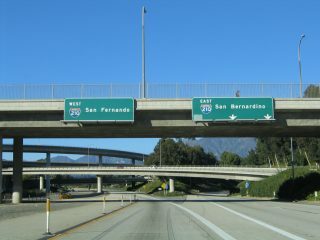 Photo taken 11/14/04. The on-ramp from I-210 westbound combines with SR 710 south ahead of the Union Street overpass. 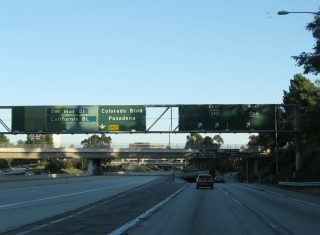 Interchange sequence sign posted a half mile ahead of the freeway end at California Avenue. Photo taken 07/08/18. A half diamond interchange connects the Long Beach Freeway stub in Pasadena with Del Mar Boulevard. Photo taken 07/08/18. 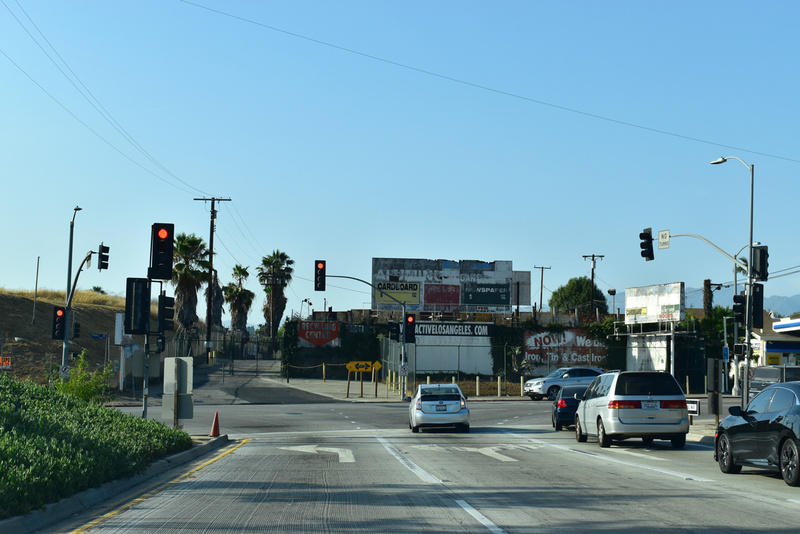 Traffic defaults onto the ramp for California Boulevard beyond the Del Mar Boulevard over crossing. 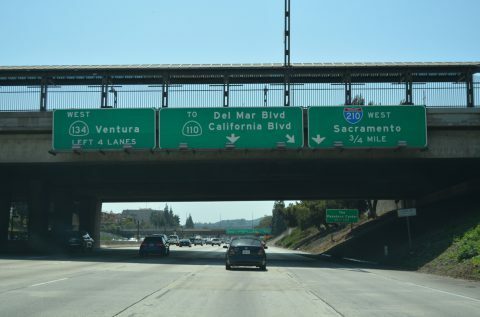 Photo taken 07/08/18. Interstate 710 turns west at Ocean Boulevard and Downtown Long Beach to cross the Gerald Desmond Bridge onto Terminal Island. 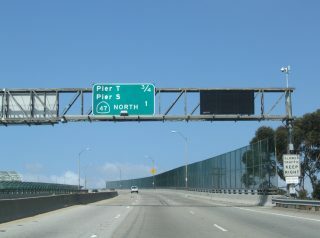 The through arch bridge spans Back Channel, a waterway connecting Long Beach Middle Harbor with the Inner Harbor. Photo taken 05/02/10. The Seaside Freeway extends west from the Gerald Desmond Bridge to ramps with SR 47/103 (Terminal Island Freeway) and Port of Long Beach facilities. Photo taken 05/02/10. 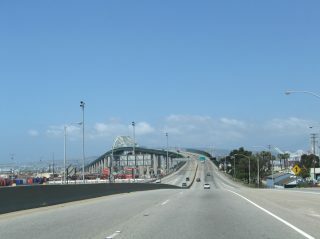 Lowering from the Gerald Desmond Bridge, the Vincent Thomas Bridge carrying SR 47 across the Main Channel from Terminal Island comes into view. 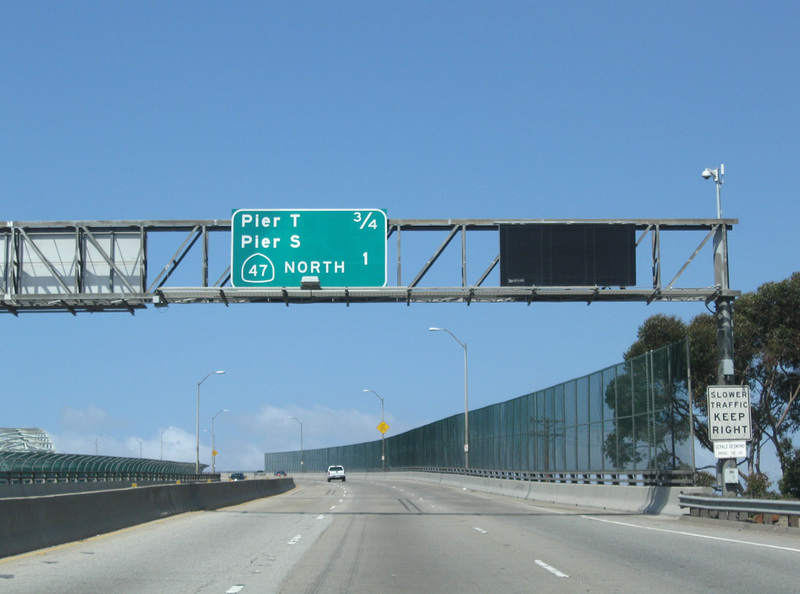 The suspension bridge was tolled until 2000. Photo taken 05/02/10. 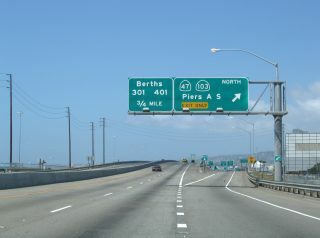 A split diamond interchange joins the south end of Interstate 710 with the Terminal Island Freeway (SR 47/103) and Pier S Avenue. Photo taken 05/02/10. I-710 concludes as the Seaside Freeway transitions west onto California 47 toward the Vincent Thomas Bridge and I-110 (Harbor Freeway) in San Pedro, Los Angeles. Photo taken 05/02/10. 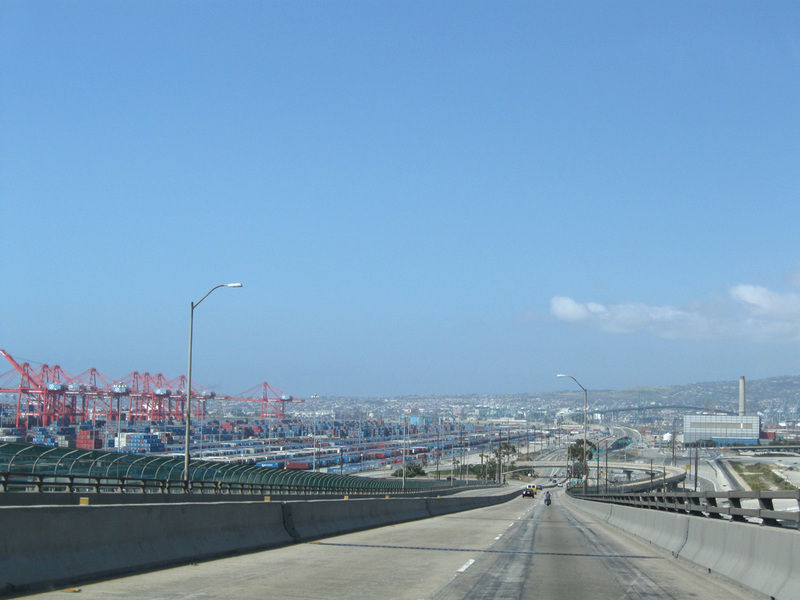 The Terminal Island Freeway spurs north across Cerritos Channel to Wilmington in Los Angeles. Photo taken 05/02/10. Interstate 710 takes over the Seaside Freeway from the departing SR 47. 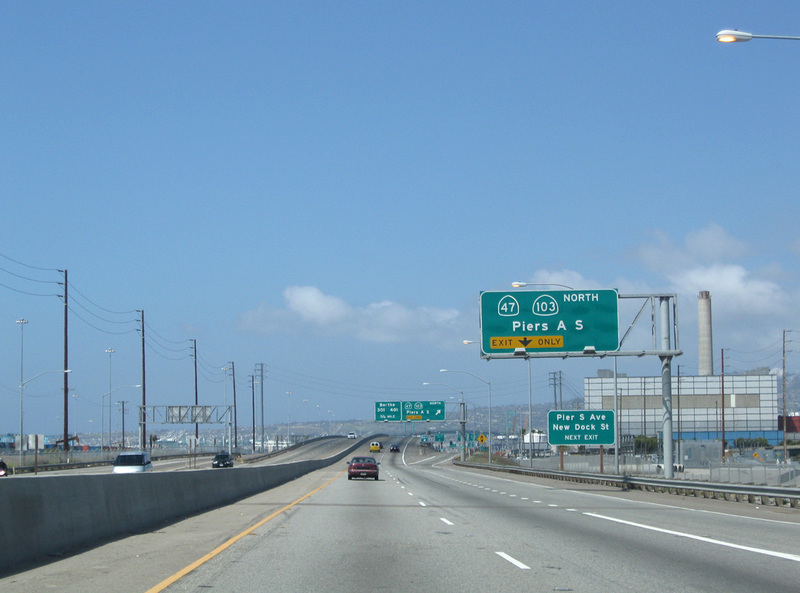 SR 47 combines with SR 103 north along the Terminal Island Freeway. Photo taken 07/09/18. Towers of the Gerald Desmond Bridge Replacement project appear beyond the off-ramp taking SR 47 to Pier S Avenue and SR 103 (Terminal Island Freeway). Photo taken 07/09/18. 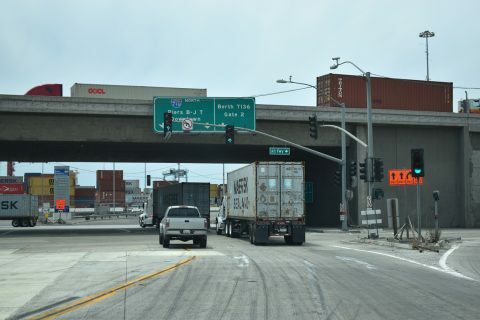 SR 47 and 103 overlap northward across the Schuyler F. Heim Bridge into industrial areas of Wilmington in Los Angeles. I-710 continues the Seaside Freeway east to the Gerald Desmond Bridge and Downtown Long Beach. Photo taken 07/09/18. 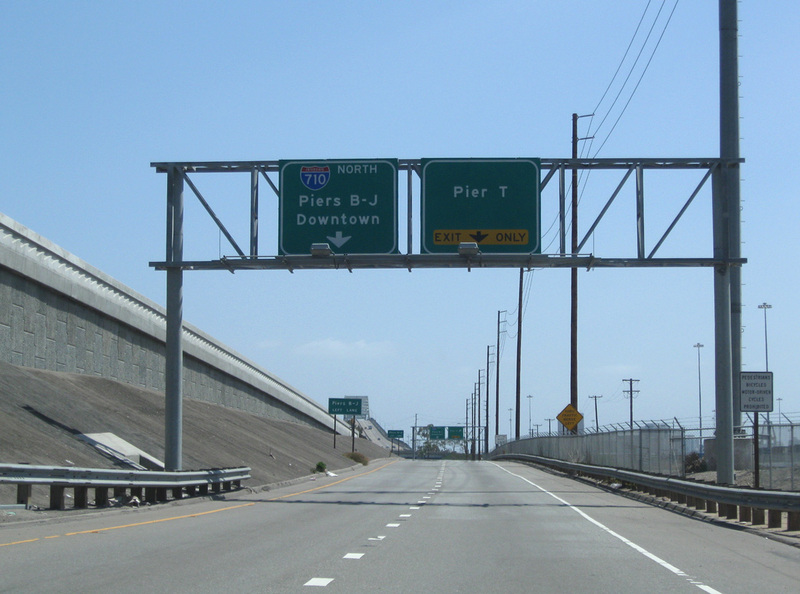 The grade separation at SR 47/103 (Terminal Island Freeway) and I-710 (Seaside Freeway) was completed in 2007. Photo taken 07/09/18. 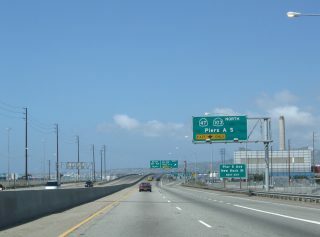 The northbound entrance ramp for Interstate 710 (Gerald Desmond Bridge) from the south end of the Terminal Island Freeway. Photo taken 05/02/10. 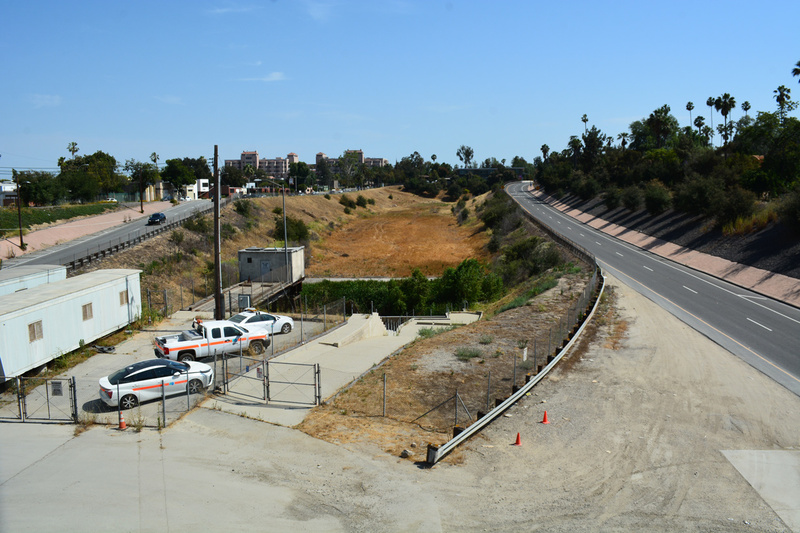 “10 months after Metro killed 710 tunnel, a nervous South Pasadena hires outside attorney to bring the fight to Caltrans.” Pasadena Star-News (CA), March 7, 2018. “The epic and ugly battle over what to do about the 710 Freeway.” Los Angeles Times (CA), May 24, 2017. Page updated March 14, 2019.